The Udacity nanodegree is a tough, but excellent, start if you want to become an Android developer. Mobile apps are the key driver behind the explosion in learn-to-code schools, with startups like Udacity, Udemy, Coursera, and others promising to give you the right toolkit and know-how to to make a career switch. Google has latched on to this trend in an effort to bolster the ranks of Android developers. A recent partnership with Udacity birthed the Android Developer Nanodegree. The semantics behind “Nanodegree” give a more hip spin on the old-school “certificate” you used to get when completing a ten-week program at a brick-and-mortar school. But the concept is the same—a short-term curriculum leads you to the right skill set to get a career change. I was offered a 30-day trial by Udacity, so I brought my passion for Android and what turned out to be a paltry skill set to the intense world of app development. Here’s what I found, with some thoughts about how it may impact your decision to jump on board a course like this. When I first signed on, I was impressed with the clean interface. I’m a fan of design that gets unnecessary clutter out of the way. Udacity does this, with big buttons for easy access to the videos, material, and discussion forums. It’s the latter, though, that eventually gave me some consternation. The options for connecting with classmates is rather scattered. There’s a discussion forum, which broke down nicely conversations by category. There was also a Google+ Community. But no, that wasn’t all. 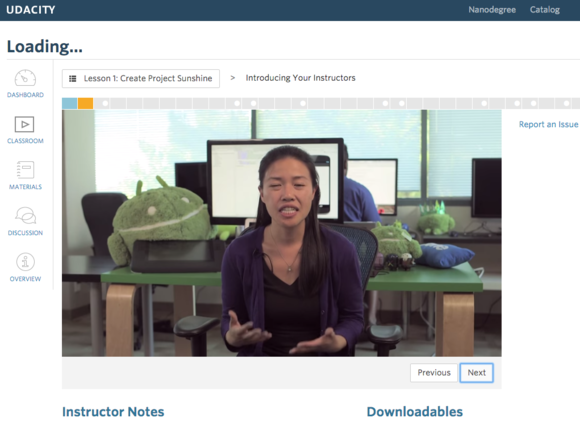 Udacity’s courses include videos to walk you through the concepts. Also, where can I get those cool, stuffed Androids? There was also a Slack community. Slack is a great tool for teams, but at 799 students at last count that’s one heck of a huge team. Fortunately, despite the size I did make some helpful connections through part of the coursework. For example, when downloading an update to Android Studio the software flipped out and crashed every time I tried to install it. Some students through Google+ recommended wiping the software and deleting all those annoying hidden files and then doing a fresh install. Sure enough, it worked. I also got a neat perspective on how international the interest in Android is. There were students from Africa, South America, the UK, and other parts of Europe, along with the United States of course. It’s easy to forget that Android, through its open nature and abundance of affordable handsets, truly has a global footprint. 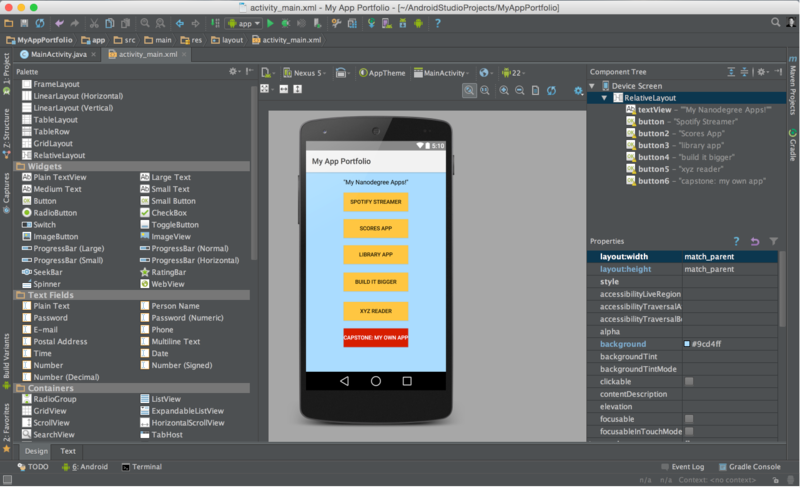 Of course, the real work comes in building Android apps with Google’s official tool, Android Studio. Developers probably have a wide range of opinions about its efficacy. Mine was simply this: wow. That’s a lot of options. Sure, I may have written a book about MIT App Inventor, but that’s a completely different ball game as it’s visual programming (no code required). While Android Studio has a layout screen, to do anything requiring complexity you’ll eventually have to get into the code. Even with buttons. I found that in naming the buttons I was getting an error; even a simple task requires configuring the Java correctly (thanks, coding gods). You’ll spend a lot of time in Android Studio if you join the Udacity Nanodegree. However, I did at least feel like I’d found some some success with the first exercise, known as Project 0. After pushing my way through it, I had a few buttons, had changed the background colors and made a pop-up notification. Hooray! Ah, but I had much to learn. In particular there are many aspects of the layout I would like to get better at. That was the premise behind the next project, which called for tapping into a movie database API for displaying popular films. 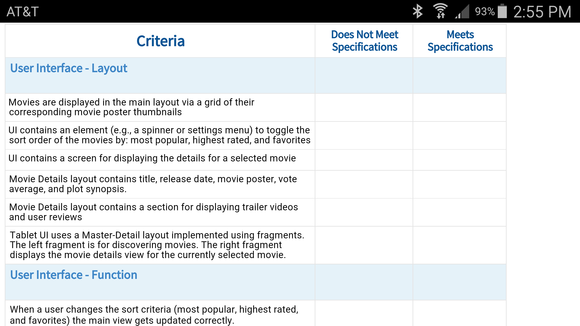 Each project has a rubric that outlines the specific benchmarks you need to hit. Later projects (which go beyond the 30 days I was granted) dive deeper into the many parts of Google Play Services, which are the fuel that Android apps need to really come to life. This is why Udacity considers its Android Nanodegree to be for those with an intermediate skill level—you know how to build an app, but now want to make it something that others would want to download from the Play Store. Another helpful resource was the Udacity Android app (there’s also one for iOS) to have access to the materials or videos so I could use a mobile device as a second screen or as a method to re-read some instructions when away from the computer. Is a Nanodegree for you? Udacity’s courses are clearly targeted at developers. So if your interests lie more specifically with User Interface design, you may want to look elsewhere (though a forthcoming class called Android Design for Developers might be of interest). Udacity recommends you have experience building in Java (or the ability to pick it up quickly through other coding work), how to share code on Github, and have built at least a rudimentary app before attacking the Android Developer nanodegree. There’s also a rather great deal: if you join the $200 per month course and complete it within 12 months, you’ll get half your tuition back. Keep an eye on the Udacity site for when the next cohort launches. If that’s too high of a skill level for you (as it turned out to be for me), then the Android Development for Beginners class might be the right fit. Once I had too many issues with the gradle, pixel density, and other new terminology I realized it was back to the bonehead class for me. You can explore the full catalog of nanodegrees and individual courses if you want to check out a different topic. Udacity gives you a two-week trial, so you can back out if the curriculum is too tough.